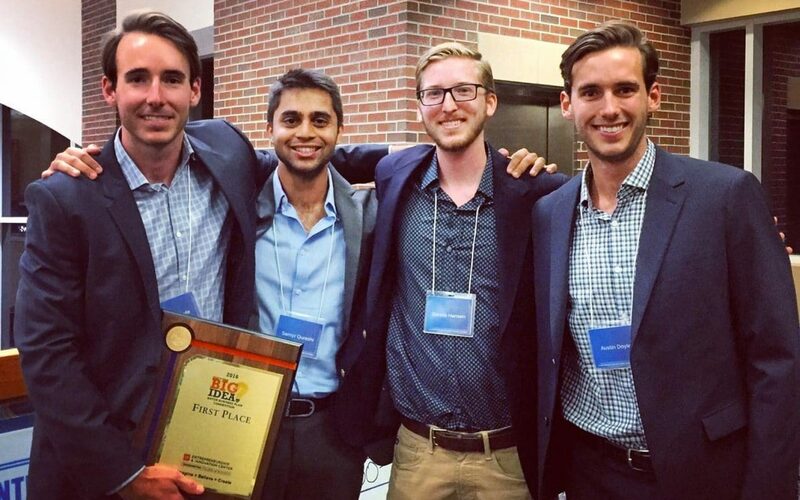 From left, Shawn Doyle, Samyr Qureshi, Dennis Hansen and Austin Doyle celebrate Knack's victory in the 2016 Big Idea Gator Business Plan Competition. Knack, a peer-to-peer tutoring mobile app, won the first-place, $25,000 grand prize at the 2016 Big Idea Gator Business Plan Competition on Friday. The Big Idea Gator Business Plan Competition, presented by the Warrington College of Business’s Entrepreneurship & Innovation Center, had more than 300 teams and individuals register for the competition. Knack, which was developed in the Gator Hatchery—the Entrepreneurship & Innovation Center’s student incubator—provides a mobile marketplace for students to find tutors. Students are able to find qualified tutors for specific courses, and can meet at a moment’s notice. Knack Chief Executive Officer Samyr Qureshi said combining the app’s mobile-first platform, peer-to-peer communication and course specificity differentiates Knack in the marketplace. Friday’s winning performance was a far cry from the first time they presented Knack in November 2014. Knack’s original concept was to be a platform where users could find local experts in any field for tutoring and lessons. Qureshi said they presented Knack during Gainesville’s Startup Weekend to unenthusiastic results. Qureshi (BA ’14) and his team, which includes UF alumnus David Stoker (BSEE 2011, MSECE 2013) and UF engineering student Dennis Hansen, moved into the Gator Hatchery in May 2015 where Qureshi said the incubator’s resources made a huge difference. Knack received assistance finding attorneys at a discount or for free to help with intellectual property agreements, provided access to Amazon Web Services for web hosting, a marketing automation tool, office space and mentorship. Qureshi said the team will use the funds primarily for product development. The event’s top three finishers were all housed in the Gator Hatchery. Dycap, which develops artificial intelligence software that automates cameras for live events, finished second and received $10,000. Atheris Games, which creates innovative board and card games, finished third and earned $5,000. The 2016 Big Idea Gator Business Plan Competition was sponsored by Marty Schaffel and Scott Zimmerman, who were the event’s underwriters. Additional sponsors include Dragonfly Sushi and Study Edge. In-Kind supporters were Bank of America, Campus USA Credit Union, Capital City Bank, James Moore & Associates, John Montague—Attorney at Law, Meacham Woodfield, the Reitz Union, Sloane & Johnson PLLC, and Wells Fargo.